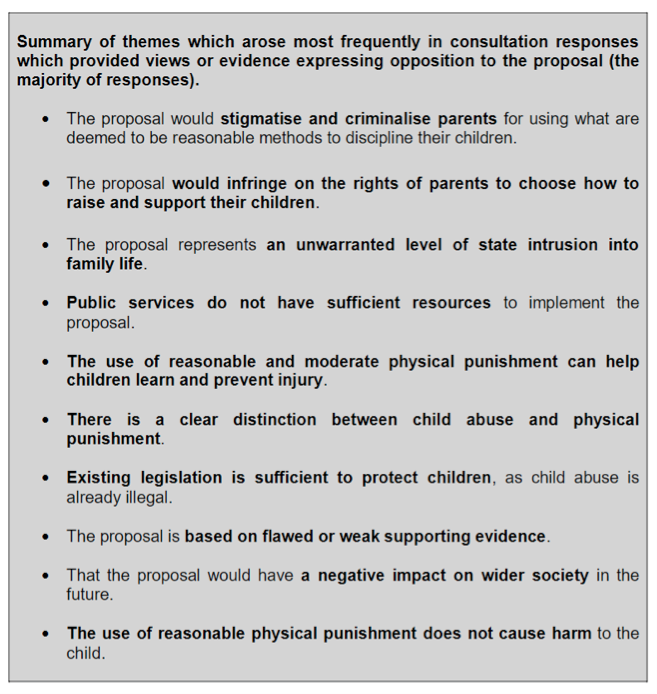 Today the Welsh Government published responses to its consultation on plans to outlaw smacking. The consultation failed to ask the key question of whether parental smacking should be a criminal offence. When Be Reasonable put that question to the Welsh public last year 76% said ‘No’. Even so, almost 50% of respondents to the Welsh Government’s consultation still thought the ban wouldn’t protect children’s rights at all. In short, there is no endorsement for criminalising decent parents. When respondents are given the opportunity to raise issues not covered by the limited consultation questions, the strength of opposition becomes even clearer. Two-thirds of responses here opposed removing the reasonable chastisement defence. The summary of those responses is below. Read Lowri’s full comment in our press release.